Thank you for making the Freedom Scramble a great success. Third Annual Freedom Golf Scramble to be hosted by Diamante Golf Club of Hot Springs Village. Sponsor opportunities are available now. 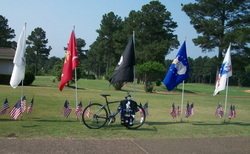 Last year we had over 250 golfers and 16 wounded warriors. Along with a visit from the LRVA Center for Living. What a chance to showcase your business. Contact John Matthews 501-915-8533 or Clyde Shirron 501-454-1047 for sponsor info. Thanks to all the hole and warrior sponsors.